Australia’s favourite street artists, Beastman and Vans the Omega collaborated to paint our mega mural here at 140. 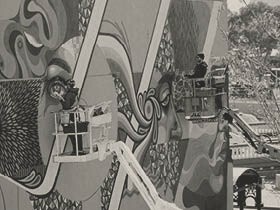 Using the side wall of a The Globe heritage building the mural is monumental. The mural is the pair’s second collaborative contribution to FORM’s PUBLIC: Art in the City 2014. PUBLIC saw 45 artists from around the globe descend on the Perth CBD and Northbridge to transform over 30 walls and spaces with world-class art.